Home Adsense Blog Earnings Blog Income Google Google Adsense Money Transfer Payments Payouts rocky's blogs STatement of Earnings The Rock's Blog Network Western Union My First Google Payment for My Blog Ads! 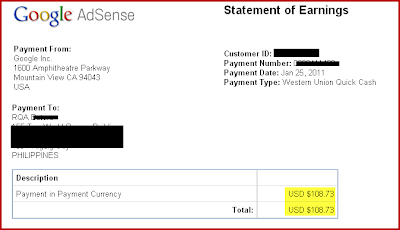 Finally last week, I got my first blog payment from Google Adsense! Yippiee!!! I got the money through Western Union! Here's the exact amount of my first earning in US dollar as well as the statement of my earnings from Google. I darken some of the important information in the statement of earnings for privacy reasons! My first total accumulated earnings from all my blog sites is $108.73. When converted to Philippine peso, it becomes Php4,733.11! Every end of the month, I will be paid by Google for all the Ads posted in my blogs provided that my accumulated earnings reach the minimum amount of $100.00. If my earning in a particular month is less than one hundred US dollar, that said earning will be carry over next month. In my case, those earnings were from last months of 2010. My earnings just speed up when my blog sites like TV Series Craze and The Rock Land become so popular and receive so many hits and visits! Did you know that I suppose not to receive that said payment?! Yup, it's because I used a different payee name in my adsense account. Instead of "Rocky" as my first name, I used "RQA". And I can't anymore change my payee name! Hayz...can you suggest how can I change my payee name since Google didn't allow me to do so?! I really inspired with these earnings! Imagine while you are enjoying developing blogs, you are earning at the same time! Nice! since when you get paid by google ad sense?